Robert Hale Ives, Jr., was born in Providence on April 3, 1837, the only son of Robert Hale and Harriet Bowen Ives. His grandfather was Thomas Poynton Ives, who together with Nicholas Brown had founded the famous Providence firm of Brown and Ives in 1796, and who had married his partner’s sister, Hope Brown. His father, Robert Hale Ives, Sr., likewise became a partner in Brown and Ives, and took an active part in establishing Rhode Island Hospital and Butler Hospital, as well as serving as a trustee of Brown University for 45 years. In short, Robert Hale Ives, Jr. was born into the mercantile aristocracy of nineteenth century Rhode Island. His character was marked by generous and manly traits, and adorned with social graces that made him the delight of the circle with which he was connected. Christian piety had also blended itself with his personal virtues, and the aspiration of his heart was not only to be an accomplished merchant and a worthy citizen, but also a disciple and servant of Jesus Christ. Entertaining only the most modest estimate of his aptitude for military life, Ives offered himself as a volunteer aide to General Isaac P. Rodman. On August 19, 1862, the Governor of Rhode Island commissioned Ives a first lieutenant with permission to report to General Rodman for duty. On September 1, Ives departed from Providence to join Rodman in Washington. Rodman was then in command of the third division of General Ambrose Burnside’s ninth Army, about to move into Maryland which had already been invaded by the Confederate forces. Ives’s pocket diary for 1862 describes in hastily scribbled entries his departure from Providence on September 1, his arrival in Washington on September 3 and his subsequent meeting with General Rodman. The last entry is made on September 7 as the division prepares to march out of Washington at 10 am. The Confederates retreated towards Sharpsburg and occupied the heights near the Antietam River. The Union forces pursued and took up position to engage them. General Rodman’s division was posted on the extreme left flank of the Union line. The battle began at sunrise on Wednesday, September 17. By one o’clock, General Rodman’s forces succeeded in crossing a ford in the stream. At three o’clock, General Burnside was ordered to attack enemy batteries on the heights to the left of the Union line. General Rodman’s division charged up the heights and took the enemy guns, but the Confederates counter-attacked and forced the division to retreat to its former position. It was in this charge that both General Rodman and Lieutenant Ives were mortally wounded. A cannon ball hit Ives in the right thigh, tearing away flesh and exposing bone, and killing his horse underneath him. Although a noncombatant, Ives’s English servant, George Griffin, rushed forward and assisted in removing him from the battlefield. He was taken first to a nearby house, then on the next day to a hospital tent pitched a short distance from the field. News of his wound was immediately sent to his father, but owing to the distance to the nearest telegraph, and the volume of Union Army communication, the report took two days to reach Providence. His father traveled to the battlefield, accompanied by Ives’ cousin, Major William Goddard, and the surgeon Doctor L.L. Miller, reaching the tent on the evening of Sunday, September 21. Still hoping that he would recover from his wound, they decided to move him to Hagerstown, some sixteen miles away. Although Hagerstown had been stripped of virtually all supplies and left in a shambles by two succeeding occupying armies, a lady of the town received the wounded officer into her home, and saw that he was made comfortable. He received the announcement of his approaching end with Christian calmness and submission to his heavenly Father’s will, and spent the closing hours of his life in exercises of religion and naming gifts of remembrance for his friends and of charity for the public objects which he wished especially to promote. Ives died on September 27, 1862, at the age of twenty-five, having received Holy Communion from a makeshift altar erected at his bedside. 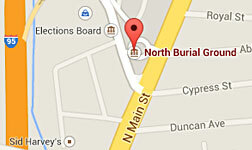 His body was brought back to Providence and interred at North Burial Ground. On October 1, exactly a month from the day of his departure from home, his funeral took place at S. Stephen’s Church, where he had been confirmed in June of 1859 and regularly attended worship and received Holy Communion before the war. According to Norman Catir’s history of S. Stephen’s, on the day before his death Ives requested his father to offer $5,000 towards paying off the $20,000 debt the parish had incurred in the construction of its new church building on George Street – provided that the remaining $15,000 be raised to pay off the rest of the debt within one year of his death. It was, in effect, a deathbed “challenge grant.” In a letter dated October 23, Robert Hale Ives, Sr., conveyed his son’s offer to the parish corporation, which in turn voted to accept the gift and begin raising funds to clear the entire debt immediately. By April 5, 1863, the $15,000 had been raised and the debt was cleared. 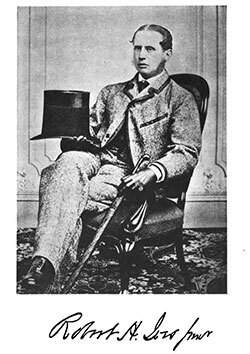 The short life and tragic death of Robert Hale Ives, Jr., afford a glimpse into the ideals of a young Rhode Island gentleman of the mid-nineteenth century – his family loyalty, his business values, his religious commitments, his sense of duty, his charitable ministrations. S. Stephen’s Church continues to honor his memory and counts him as one of the founders and benefactors. Congregants marked the hundred-and-fiftieth anniversary of his death in September 2013 with prayers at his memorial window. Ives was, of course, only one of many Rhode Island officers and enlisted men killed or mortally wounded on that “bloodiest day.” Yet perhaps his story can give us insights into the mindset and worldview of many of the young men and women who volunteered for service in that terrible war. Barker, Harold R. History of the Rhode Island Combat Units in the Civil War, 1861-1865. 1964. Gallagher, Gary W., Ed. Antietam: Essays on the 1862 Maryland Campaign. Kent State University Press, 1989. McPherson, James M. Crossroads of Freedom: Antietam. Oxford University Press, 2002. Slotkin, Richard. Long Road to Antietam: How the Civil War Became a Revolution. Norton, 2013. See the “historical note” on the Ives-Gammell-Safe Papers on the website of the Rhode Island Historical Society, at http://www.rihs.org/mssinv/Mss509.HTM (downloaded September 27, 2012). See also The Chad Browne Memorial consisting of Geneological Memoirs of a Portion of the Descendants of Chad and Elizabeth Browne, with an Appendix containing Sketches of other early Rhode Island Settlers, 1638-1888, Compiled by a Descendant (Brooklyn, New York: Printed for the Family, 1888), 81-82. Bartlett, Memoirs of Rhode Island Officers. Diary, Rhode Island Historical Society, Ives-Gammell-Safe Papers, Mss. 509, Box 5, Folder 4. Henry Waterman, text of funeral sermon of October 1, 1962. Rhode Island Historical Society, Ives-Gammell-Safe Papers, Mss. 509, Box 5, Folder 5. Bartlett, Lives of Rhode Island Officers. Several sources, including Bartlett, give Ives’s age at the time of his death as twenty-six, but if the birth date of April 3, 1837, is correct, he would have been twenty-five. Henry Waterman, “Communion Address St. Stephen’s Sunday October 5th 1862.” Rhode Island Historical Society, Ives—Gammell—Safe Papers, Mss. 509, Box 5, Folder 5. Norman J. Catir, Jr., Saint Stephen’s Church in Providence: The History of a New England Tractarian Parish 1839-1964 (Providence, Rhode Island: St. Stephen’s Church, 1964), 41-42. Waterman, text of funeral sermon of October 1, 1862.